I had the pleasure this morning of sitting on our verandah and watching the activity of our resident birds as they fed and socialised in the bush around our house. At the time I was watching a video update from Tom Brown Jnr (all about the power of now and the silence). Tom always has had the ability to feed into my life with this sort of remarkable coincidence. Suddenly a Noisy Friar bird’s call captured my attention and I found myself out of my current experience, instead drawn into the bird activity around me. I started to just sit silently - watching and listening to the spirited flow of these birds. I was eagerly observing the feeding and earnest social dynamics of the Noisy Friar bird flock. I was reflecting on how familiar they seem to me as we have shared our lives together on this land for the past 10 years. This observation morphed into a feeling of connection to their movement. Their flow captivated me and in response my mind fell completely silent. My body sat still, my emotions were still and as a result my presence was diminished, almost to nothing. At that moment the richness of the land came to life even more fully. With the Friar Birds in the background dominating the upper canopy, the middle and ground canopy birds began to show themselves. A pair of Firetails (Red Browed Finch) flew through the space and then a family of Bar Shouldered Doves appeared on the edge of the bushes. The Bar Shouldered Doves consisted of a breeding pair and two juveniles. They were softly cooing and bobbing their heads while they walked together picking grass seeds off the ground. Being a parent myself I could feel the care the parents were taking to guide the young ones. It felt delicate and lovely to share in. Another adult appeared who seemed to carry some sort of news which triggered a decision for the group to all walk off behind a little shack at the edge of the clearing. As soon as they had moved on a pair of Common Bronzewing flew in who also started to feed off the ground. They were joined by a Lewin’s Honeyeater who appeared in the mid-story. All such beautiful birds with intricate movements and plumage to savour. A pair of Eastern Spinebills started to dart around the space and the Friar birds excitedly kept dominating the upper canopy as they continued to feed off the Banksia nectar. Layers of birds, family groups, feeding activity, territory and song all weaving together to create the baseline symphony. Just then a neighbour's cat began to move into the space. I wondered if all of this commotion had attracted her? As she started to cautiously approach the area the Bronzewing instantly flew to the top of the shack and proceeded to watch her. The Lewin’s Honeyeater took space and the Noisy Friar birds announced her arrival with their clucky song and body language – making sure that everyone knew she was on the scene. She continued to slowly move towards the feeding ground area. Her lazy approach created a spherical wave of silence which reached about three meters in every direction. All the birds (myself included!) were watching her and waiting for her to signal her level of threat. She sensed this and instantly responded with her predatory instincts - becoming even more silent and slowing down her movement until she froze. Breaking the moment, the pair of Spinebills started to pop left and right through the cat's silent sphere. Acting confident in their appraisal of her casual predatory intent they continued to feed on the sweet Banksia cones, until their attention took them elsewhere. All of a sudden a pair of Yellow Tailed Black Cockatoos flew at speed directly across the space, hotly pursued by two ferocious Noisy Friar birds – they were acting more like fighter pilots than birds! My heart skipped a beat as the Friar birds successfully defended their territory from those pesky Black Cockatoos. Instantly while this chase was happening the whole flock of Friar Birds became quiet. Upon the successful deportation of the Yellow Tail intruders the whole flock erupted into indignant song – all of them clearly re-establishing their dominance of the space at that height of the canopy. I took a deep breath and felt so beautifully connected to these animals and the patch of land we live on. A wave of gratitude swelled within me for the precious gift of these birds, their wild awareness and their song. By this stage the cat had moved off and in the distance I could hear our resident Tawny Frog mouth starting to hoot. Gifting me with another deep sense of connection to this land and its beauty. The simple pleasures of deep nature connection! Such a joy and I hope you can also experience the joy of dropping into silence and simply watching, listening and becoming one with the birds who you share your life with. 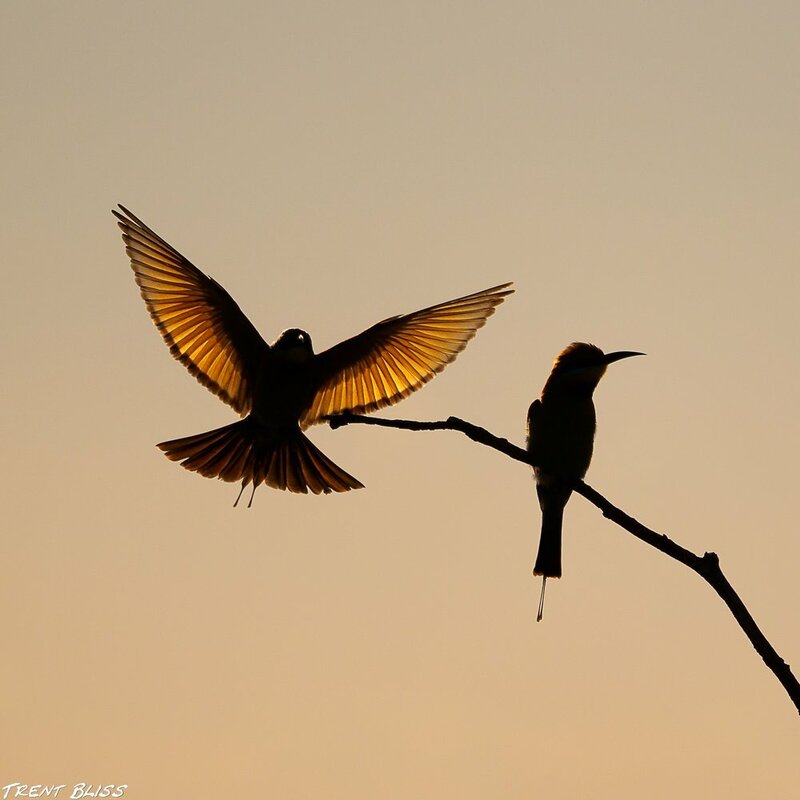 A big thank you to Trent Bliss from Trent Bliss Photography for his stunning Rainbow Bee Eater photo.